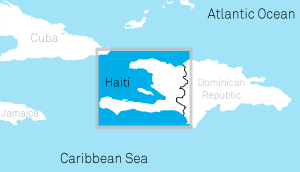 The devastating 2010 earthquake in Haiti destroyed a majority of the country’s health infrastructure. Global Healing joined in the international relief effort by sending volunteer physicians to support Haitian medical personnel. With more than half of the population living in poverty, recovery from the crisis has been slow, and significant need still exists to improve standards of care. In response to the crisis, Partners in Health opened a new teaching and referral hospital in Mirebalais, right outside of Port-au-Prince. The Hopital Universitaire de Mirebalais (HUM) provides care to nearly 185,000 people in Mirebalais and two surrounding communities and HUM clinicians regularly see up to 700 patients a day. Global Healing has joined forces with Partners in Health to establish an on-site blood transfusion service supporting the needs of the hospital. Thanks to training and equipment we have provided, the blood bank is now able to support critical services at the hospital including obstetrics, surgery, post-operative care and pediatrics. 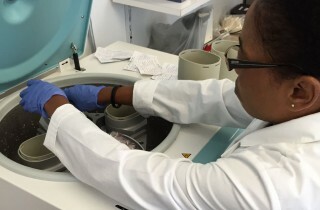 In order to develop a self-sufficient blood transfusion service, we continue to provide training to improve laboratory quality and build the skills of the blood bank staff. With the help of our highly qualified medical volunteers, we are enabling the hospital to provide the blood products needed to save patients’ lives. Our work in Haiti is made possible through a generous grant from the Izumi Foundation.